home Sloan MoBE Program Fungi on residential surfaces: sinks are sources, other surfaces are sinks. Studies looking at the microbiology of the built environment find a lot of diversity. Sometimes it seems like anywhere you look for your target critter, you can find it. More and more these expeditions rely on sequencing DNA, which can detect all kinds of cells: in addition to ones that are living or dormant, PCR can also work on (courtesy of the Princess Bride) “mostly dead”, or even “all dead” cells. Identifying what microorganisms are actively growing indoors then becomes a little trickier. One way we tried to look for sources of growth of fungi indoors was to look at surfaces we thought would support growth, and then compare those to the fungi that are found in the surrounding air. We swabbed different surfaces around a bunch of apartments in a university housing complex – surfaces that included window sills, different drains, and even the residents’ foreheads. We were looking to see if we could link these areas of presumed growth with what fungi we found in the air. We were thinking about this in the ecological framework of source-sink dynamics, where some high quality habitats support population growth (and act as sources) for those habitats that don’t (and act as sinks). It turns out, we were thinking about these dynamics in the wrong direction, because our data showed that instead of being a source, most residential surfaces were sinks for what was being transported by the air. And what fungi were being transported by the indoor air seemed to be dominated by fungi from the outdoor air. The exception was the plumbing, where drains did show a community of fungi whose composition was different from that of the air. Nothing makes the point that most surfaces were sinks as great as finding ergot (Claviceps purpurea) on people’s foreheads. Ergot is a fungus that grows on rye grass and other grains, and when some compounds made by the fungus are ingested – if, for example, that grain is used to make bread – it causes ergotism, which can induce hallucinations and gangrene. 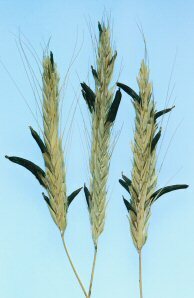 Ergot is found on grasses nearby to the sampling site. So, the most likely scenario is that some ergot, even in trace amounts, ended up on the residents’ skin, and because there is not much fungal biomass there in the first place, we could identify it in our DNA-based survey. We did this study in the San Francisco Bay Area, where a mild climate makes for a lot of potential for outdoor-indoor interchange. Windows are often left open – year around – which could skew how much we think the indoors looks like the outdoors compared to other climates. Secondly, this housing complex was recently rebuilt, and the buildings are pretty new. The oldest one was 11 years old at the time of sampling, but most were less than 6 years old. Typically, well-built buildings usually take a little longer for mold-problems to arise. Both of these facts undoubtedly played a role in what we found, and further studies will be needed to tell us exactly how big. In addition to these biological findings, I also wanted to make a small methods point. As mentioned in the paper, we analyzed the amplicon sequence data with both QIIME and UPARSE, the latter being a newer approach to binning sequences into taxonomic units. With UPARSE, we found a lower total number of taxa (i.e. reduced OTU inflation) but patterns for how samples were related to each other in composition were identical. I look forward to further discussion on these approaches (and maybe even the implementation of UPARSE within QIIME?? ).